It seems at first glance to have come from sort of jukebox musical auto-generator — Sir Philip Sidney’s epic poem of good governance and inappropriate desire, the Arcadia, with the music of chart-topping New Wave girl group The Go-Go’s? What kind of half-baked post-Mamma Mia cash-in is that? 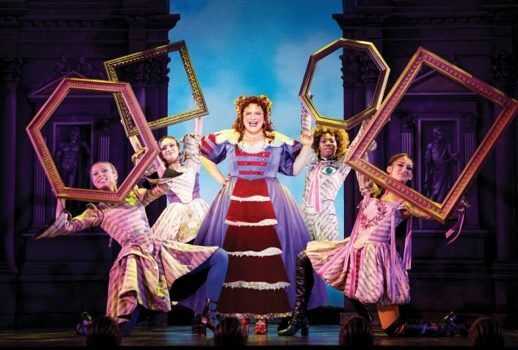 But Broadway’s new Head Over Heels is anything but under committed; it’s a show whose irresistibly fun spirit and infallibly good heart more than compensates for a clunky book. Extremely loosely based on Sidney’s pastoral romance, Head Over Heels tells the story of a court in exile, fleeing a prophecy given to King Basilius (Jeremy Kushnier) by the oracle Pythio (Drag Race alum Peppermint, making history as the first trans woman to create a Broadway role) that he will lose his daughters to unsuitable suitors, lose his throne to a challenger, lose his marriage to adultery committed with his own wife Gynecia (Rachel York) and lose his kingdom’s magical cultural synchronicity — Arcadia’s “Beat” (it’s the Go-Go’s biggest hit; they had to get it in somehow). The Arcadian court takes to the forest, where sexual and romantic entanglements start to get messy. There’s pampered older daughter Pamela (Bonnie Milligan), as quick to reject male suitors as she is slow to realize what she really wants is her long-suffering lady’s maid Mopsa (Taylor Iman Jones). And there’s her ingenue sister Philoclea (Alexandra Socha), whose hapless shepherd suitor Musidorus (Andrew Durand) has been banished from her company but returns in drag as the Amazon warrior Cleophila to pursue her, only to be pursued aggressively himself by both King Basilius and Queen Gynecia. Needless to say, the music of The Go-Go’s doesn’t make a lick of sense with this plot, which doesn’t make a lot of sense to begin with, but it doesn’t take much elbow grease to get a Greatest Hits worth of spunky but slightly generic up-tempo love songs into a show that is all about desire, whether mutual or thwarted, conventional or transgressive. The look of the show helps out here, establishing a charmingly maximalist 80’s-meets-Elizabethan aesthetic with lots of neon doublets and hose. The scenic design by Julian Crouch and costumes by Arianne Phillips all strike this note, down to the cat-eye sunglasses on the mermaid backing chorus for Taylor Iman Jones’ “Vacation” item number. This is not to say that Head Over Heels is a totally self-integrated work of theater; on the contrary, the book, written by Jeff Whitty and adapted for Broadway byJames Magruder, fails to strike the same tone as the design and is full of jaw-clenchingly clunky ersatz Elizabethan English dialogue that suffers even further in juxtaposition with the contemporary English of the songs. In Head Over Heels the plot is hardly the point, and it gains nothing by scenes where characters trade ye olde zingerse that sound more like Yoda than Shakespeare, especially since it only takes the music starting back up to make these characters fun again. And they are fun! The standout by far is Milligan, who has been with the show since its Oregon Shakespeare Festival debut and is totally at home in the role of Pamela, bringing scads of stage-presence and vocal confidence to the petulant, temper-tantrum-prone princess. As Musidorus, Durand is very sweet, but as Cleophila he’s irresistible, happy-go-lucky and just a little loopy in a platinum blonde wig and red lipstick. York and Kushnier make a fun team as the royal couple — her icy stage presence and smouldering alto voice with his frantic energy and scrappy tenor. Peppermint’s star power is undeniably vivid as the oracle Pythio, who in their unapologetic, binary-busting queerness has challenged conservative conventions offstage and on — most notably those of New York Times chief theater critic Ben Brantley, who issued an apology for his review, which in attempting to match the light hearted tone of the show seemed instead to flippantly misgender its characters. It seems absurd that a show as unambitious and feel-good as Head Over Heels should so entirely fly over the head of a critic as well-respected as Brantley, but that it did so speaks perhaps to the growing pains of a medium unused to accommodating trans and nonbinary stories, and least of all optimistic ones. Head Over Heels may be goofy and kind of dumb, but it’s not a dumb, goofy show with dumb, goofy gender representation, it’s a dumb, goofy show with vitally smart, empathetic gender representation, where all the queer characters survive to the curtain call and every character is constantly challenged to think more expansively and acceptingly. In a theatrical landscape that is still wedded to queer loss and tragedy, the humor and humanism with which Head Over Heels approaches its queer characters is remarkable and touching. Sure, you could roll your eyes over the show’s incorporation of Intro to Trans Acceptance didacticism into an otherwise cheerily nonsensical romp, but why bother? At the end of the day, Head Over Heels is a show where literally every character ends a little queerer than they started, and I have to believe that counts for something.